Technology has revolutionized the mattress industry. Several mattress types are available at a variety of prices. The dizzying array of choices can make it difficult to know where to start. As the choices have increased, so have the costs. Prices can vary widely depending on the type of mattress you want. Learning about the different types and their average costs can make shopping easier. The prices below reflect the average cost for a queen-size mattress and foundation, according to Kyle Mangum of Mattress Country in Florence, Alabama. The queen size was selected for comparison because it represents the median-size mattress. Get the most for your money when selecting a mattress. An innerspring mattress is made with wire coils, layered with a thick padding of netting or wire and topped with a quilted or pillow-top covering. A typical mattress should contain 300 to 800 coils with a wire gauge of 163 to 194 millimeters. A queen-size mattress averages about 500 or more coils. A firm innerspring mattress is a good fit for back or stomach sleepers. Side sleepers need a softer mattress and would benefit from pocket coil springs to reduce the tension. A queen innerspring mattress set can cost $500 to $2,000, with a good quality mattress with pocket coils at the top of the range. A memory foam mattress is ideal for a side sleeper because it conforms to the body, according to Choose-A-Mattress. Foam mattress quality is measured in density rather than the number and thickness of coils. Look for a mattress to have two to three pounds density per square foot, with higher end models having four to six pounds per square foot. It's also important to inquire about a mattress' HR, or resiliency, and its tensile strength, or how far the mattress can be stretched without tearing. Latex has a better resiliency and tensile strength. Memory foam and latex are often combined into one mattress. Queen foam mattresses with two to three pounds density per square foot are $800 to $2,000. A name brand, five to six pound density mattress can cost as much as $4,000. Air mattresses place less pressure on the body and distribute weight more evenly. They are used mostly in hospitals and nursing homes, but brands such as Select Comfort and Comfortair are common in homes as well. A good-quality bed ranges from $1,000 to nearly $4,000. Waterbeds were a popular choice in the 1970s and '80s and are widely available today. Modern waterbeds come soft-sided with a pillow top and some foam inside, and hard-sided with the traditional wood frame to help maintain mattress shape. A waterbed is an excellent choice for those with allergies. Some beds also come heated, which is beneficial to those who live in frigid climates. Soft-side waterbeds range from $1,300 to $1,800, says Jazmyne Miller of Big Sur Waterbeds in Madison, Alabama. Miller said an average queen-size, hard-side waterbed costs $550 to $1,200. 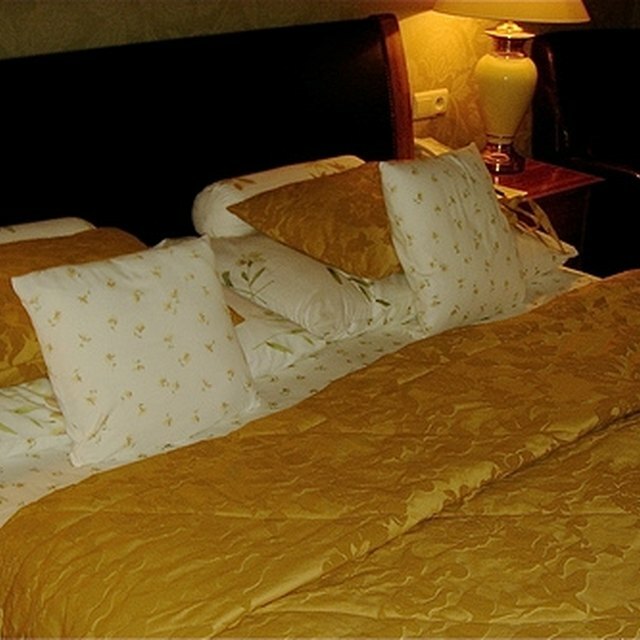 She added that there are additional costs such as waterbed sheets for hard sides and water conditioner for both types. Expect to pay around $500 per year in electricity costs to heat a waterbed, according to Choose-A-Mattress. The futon is the least expensive of the choices mentioned. It is of Japanese origin and consists of a cotton- or wool-filled mattress with a cotton or canvas cover. It can be rolled up and stored or placed on a frame. The frame can be pushed in to serve as a sofa or pulled out to make a bed. It's a suitable choice for dorm rooms or small apartments. The mattress costs about $100. Mattress and frame together range from $200 to $600. Sales Manager Kyle Mangum: Mattress Country, Florence, Ala. Sales Associate Jazmyne Miller: Big Sur Waterbeds/Oak Express, Madison, Ala.
Kelly Woods began her career as a newspaper reporter in 1998. Her beats included education and city government. She currently writes for eHow and Answerbag. She received her bachelor's degree in English from the University of Montevallo in Montevallo, Ala. Her Master of Education is from Freed-Hardeman University in Henderson, Tenn.